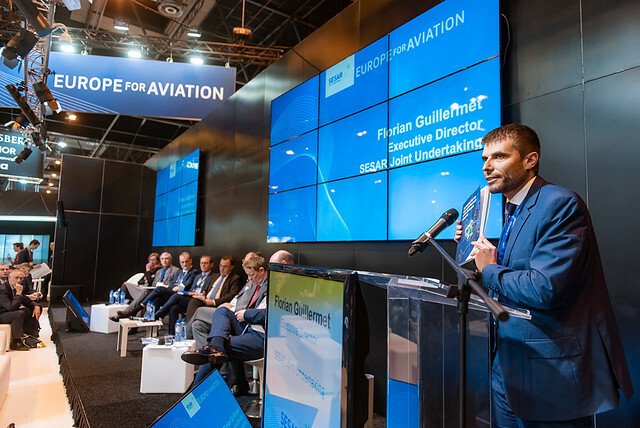 “Europe for Aviation” was the theme around which European aviation organisations working to implement the Single European Sky (SES) gathered at this year’s congress. The “Europe for Aviation” stand and theatre hosted a wide range of debates, presentations and guided walking tours, Single European Sky Awards, illustrating the collaboration in action between European aviation organisations working to implement SES, namely the European Commission, EUROCONTROL, SESAR Joint Undertaking (SESAR JU), SESAR Deployment Manager (SESAR DM), European Aviation Safety Agency, European Defence Agency, Innovation and Networks Executive Agency (INEA), and EUROCAE. 8,000 visitors from around the globe, including 253 exhibitors and 200+ speakers, the world's largest air traffic management (ATM) event. 16 walking tours, as well as one dedicated to press and one to representatives from DG MOVE and FAA, with some 100 presentations, promoting SESAR members activities across the SESAR 2020 and SESAR deployment programme. Read more on two specific Walking Tours: Airspace Capacity and U-space. 15 sessions in which SESAR JU presented its work in areas of U-space, civil-military collaboration, global interoperability, CNS, exploratory research, among others. 1 virtual reality tool on seamless data exchange in the ATM. 1 interactive screen showing SESAR 1/2020 solutions and where they are being deployed in Europe. 1 SESAR winner in the Jane’s awards, the exploratory research project COCTA – read News and Tweet. First FANS-C equipped A320 aircraft to Easyjet - an important piece of kit to demonstrate SESAR i4D for more predictable flights and ATM – see Tweet - Read news. Update on preparation of live U-space/SESAR trials in the Gulf of Finland – read press release - Read news. Well over 600 tweets referencing #EuropeForAviation, as well as 100 tweets made by the SESAR JU during the event, which were retweeted 132 times and liked over 500 times. 300 distributed SESAR Solutions Catalogues – Third edition, Airspace Architecture Study, as well as many more publications.